Xintang is the denim capital of the world. One in three pairs of jeans sold globally is made in this industrial town, in Guangdong province. At first sight its production statistics are impressive: the factories there produce 300 million denim articles a year, employing 220,000 people. 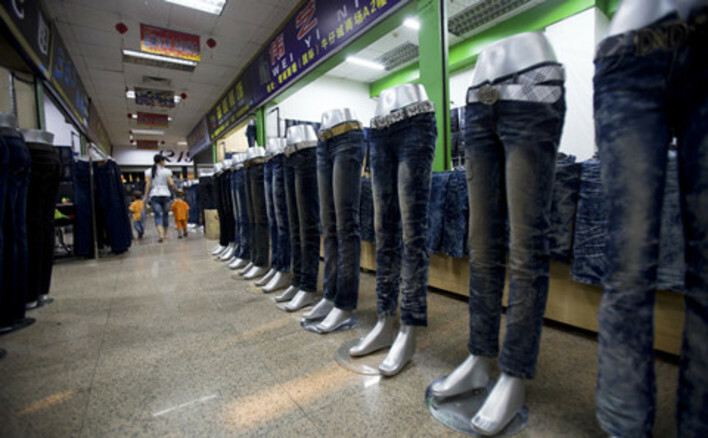 Around two-thirds of the denim clothing made in China is produced in Xintang. But Xintang is undergoing a crisis. Raw material costs are rising, it's hard to raise capital, labour costs are continually increasing, and there's a lack of well-known brands. 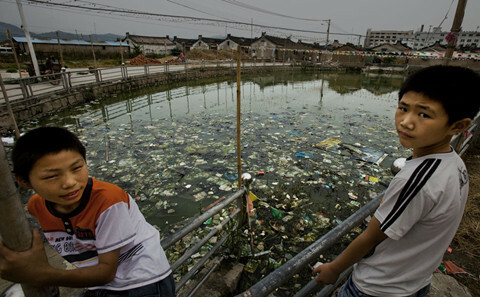 Yet the town’s most serious problem is obvious from a local saying: "Xintang is so badly polluted that you can't give away houses for people to live there." The water in the East River in Xintang has turned blue and smells strange. Under the hot sun, a local man, Dong Yaoming (not his real name), points at a map and says, "This stretch [of pollution] is definitely caused by the bleach factory. 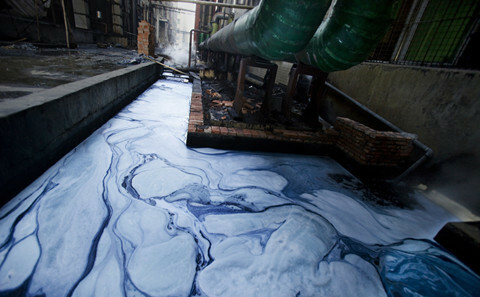 Only those factories which dye denim emit such filthy water. 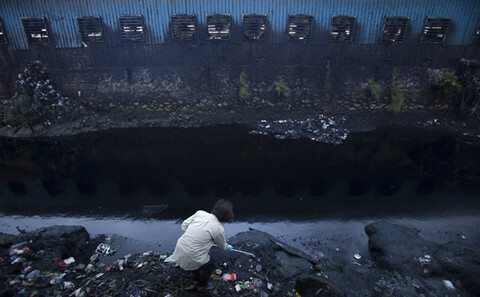 They spill the water from dyeing straight into the East River." Sixteen years ago he would go swimming with his girlfriend in the East River. "But now, I wouldn't if you paid me." Making jeans involves a number of stages, including design, washing, adding rivets, cutting and packaging. Washing makes the cloth look old and gives it texture. Whether a pair of jeans looks fashionable, medium-range or cheap mainly depends, apart from the cotton and the design, on how it is washed. But the waste water from the washing mainly goes untreated into the river. Xintang's Dadun Village waste water treatment plant has been closed for over a year. Next to the Nizi Bridge in Xintang there are piles of blue fluff like the lint which accumulates in the filter of a domestic washing machine. It has rained in the last few days and there are clear signs of blue dye in the water. In November 2010 Greenpeace published a survey which found that at three sampling sites in Xintang, the amounts of lead, copper and cadmium in the riverbed exceeded national "soil environmental quality standards". This included a sample of river mud with cadmium levels 128 times over the limit and another where the water pH level was 11.95. Local people are well aware of the pollution from the denim industry, but incomers seeking work and people in downstream areas often have little idea of the damage being caused. Xintang's first dye mill was opened in Dadun Village. 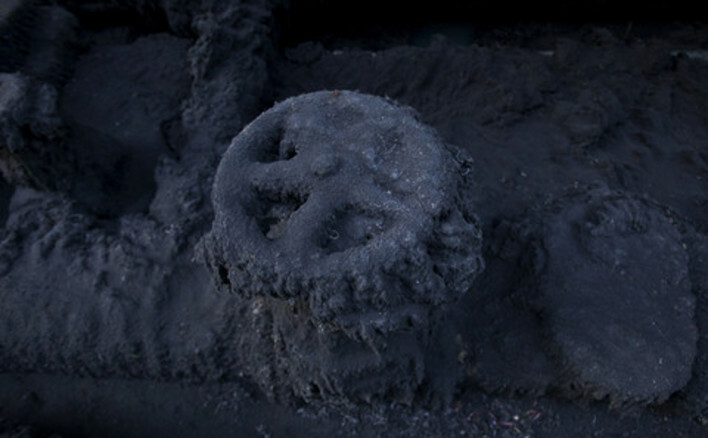 It polluted the river and local people were furious. From 2006 they started to put Xintang under some sort of government control and gradually began moving denim washing and dyeing plants to an environmental industrial park in Xizhou Village on the west side of town. There is clearly nothing "environmental' about this environmental industrial park. Its main roads are noisy with the roar of boilers, the air stinks of sulphur and ditches are full of dark blue water. Trees along the road have strips of blue cloth hanging from them, the dust in the roads is light blue. The water in all the streams in the area apart from one is black and stinking and the White River is the worst; the slow flowing water is as black as Chinese ink. In 1996 Xizhou Village had fertile soil and was full of fruit trees and well known as a fishing village. Now there is almost no sign of farming. Instead it's an industrial park with oil tanks, a power station and a waste water treatment plant. 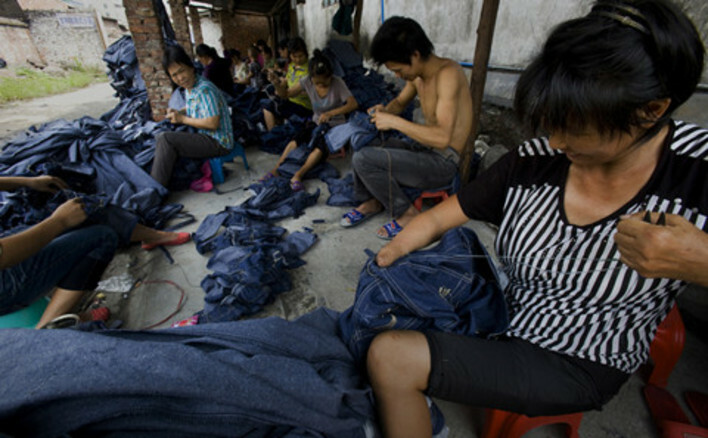 Greenpeace's head of water pollution prevention and treatment Zhao Yan said, "Xintang's denim industry started in Dadun Village, but now Xizhou has replaced Dadun and that's where most complaints are coming from." Because of the pollution local people are unwilling to work in this "dangerous" industry even for 2,000 yuan (US$325) a month. Almost all the people working in these factories are from other provinces. 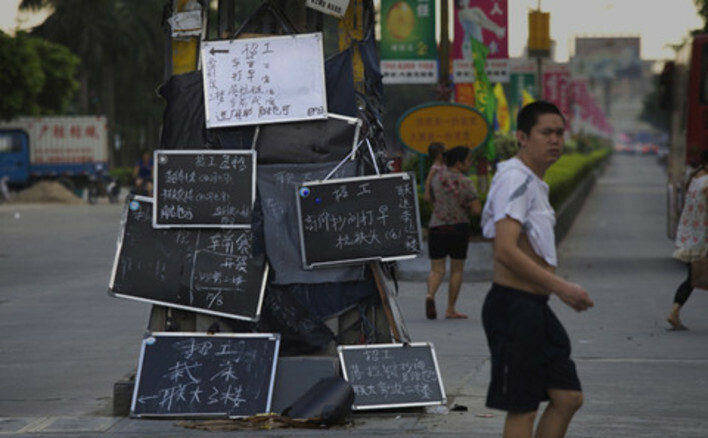 Xintang has a population of 220,000 people with local residence cards [hukou], while the number of immigrants amounts to 500,000. In 2011 there were riots in the town over the treatment of migrant workers by local officials. 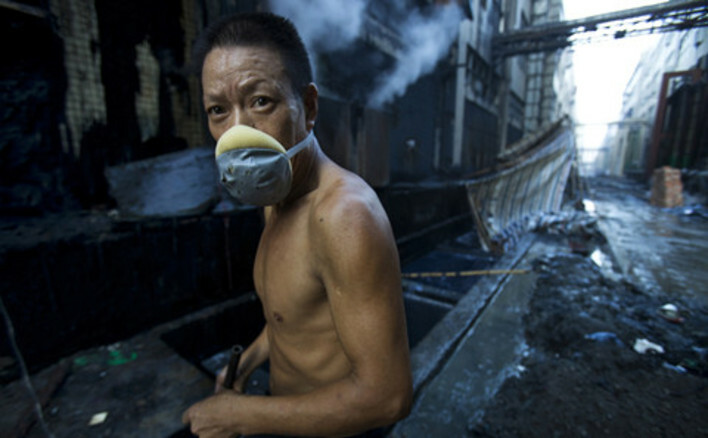 Yang Ming (not his real name) who works in the Ocean Cloth Washing Factory worked in a lock factory in Lishui in Zhejiang province until six months ago, where he earned 2,000 yuan a month. One day he got a phone call from a friend in Xintang who told him he could earn 5,000 yuan (US$815) a month in the factory. "After I had worked in the cloth washing factory for a couple of months I realised that dyeing and washing involved using lots of chemicals. Local people told me that people who work for long in this job can't have children," Yang said. Although all Yang does in the factory is pressing, he breathes the same air as everybody else. Another group of workers are known for their bad smell because their clothes smell of potassium permanganate which is sprayed on the denim to make it look pre-used. "When it's hot in the summer, the spray fills the air and people come out in rashes," Yang said. Nobody told Yang anything about the harmful substances used in the factory, which made him all the more worried. Most of the workers are temporary labourers who aren't given a contract to sign and don't have any insurance. They don't receive their first wages for three months, so if they feel ill after the first month they have to wait two more months until they are paid. Apart from the health of the workers, there are also concerns about drinking water for people living downriver. The East River is the source of drinking water for several million people living in Guangzhou. Even more seriously, the polluted water is carried further downriver, threatening the water security of the cities of Dongguan and Shenzhen. This article was first published by DEEP magazine. Photos by Lu Guang.